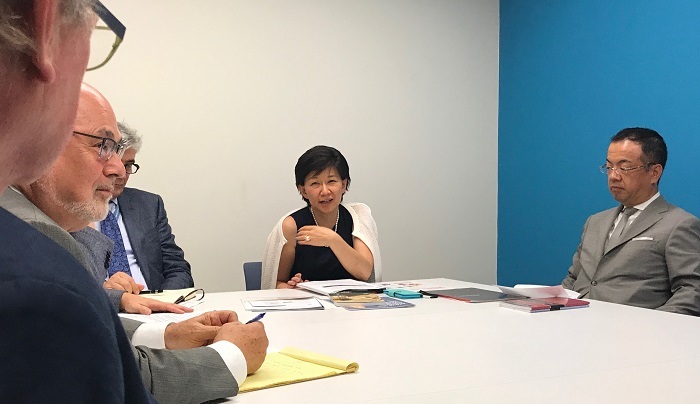 UNFOLD ZERO joined Mayors for Peace, Religions for Peace and Parliamentarians for Nuclear Nonproliferation and Disarmament in a meeting on Friday June 30 with Ms Izumi Nakamitsu, the United Nations High Representative for Disarmament Affairs. We commended Ms Nakamitsu on her appointment to this important position, and we discussed cooperation between her office (the UN Office of Disarmament Affairs) and our organisations, as well as cooperation with the UN Secretary-General. We discussed follow-up to the nuclear weapons prohibition treaty currently being negotiated by non-nuclear States, the International Day for the Total Elimination of Nuclear Weapons (September 26) and the 2018 UN High Level Conference on Nuclear Disarmament (HLC). One aspect we raised was how to engage the nuclear-armed and allied States in nuclear disarmament, including at the highest level, and what disarmament measures it might be possible to move them to adopt at the 2018 HLC. We noted that later this year we will organise a major international civil society conference on Preparing for a Successful 2018 HLC. The conference will be organised as a two-day series of webinar panels in which people anywhere in the world will be able to participate without having to travel to New York. Mr Ware explains the joint statement ‘A Nuclear-Weapon-Free World: Our Common Good’. We presented to Ms Nakamitsu ‘A Nuclear-Weapon-Free World: Our Common Good‘, a joint statement of mayors, parliamentarians and religious leaders from around the world supporting UN initiatives for nuclear disarmament. The statement also promotes common security approaches to security in order to end the reliance on the threat or use of force (and especially nuclear deterrence) in international relations. The statement will remain open for endorsement until the 2018 HLC. We encourage mayors, parliamentarians and religious leaders who have not yet endorsed to do so. Mr Jonathan Granoff, President of the Global Security Institute.